[by Nick] Hey there everyone, it's Nick here. You guys know what today is right? Yep its Monday which means a new Nosh Show is now available for you listening pleasure. That's not all though! Today is a special Monday because it marks my two year anniversary for writing for this glorious website. To think it's already been two years is mind blowing. Do I get my honorary diabetes membership card yet? Like last year, I'd like to thank you all for your continued support and all of the friends I've made along the way. We're trying to take this website to a whole new level and we couldn't do it without each and every one of you. Now with that said, let's have some cake, errr ice cream! 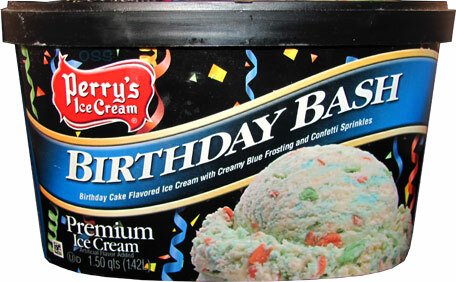 Since it is my two year anniversary, I’d say Perry's Birthday Bash ice cream is the perfect flavor to celebrate the occasion. This is actually my first time trying Perry’s ice cream so why not break into it with something celebratory? There’s nothing better than an ice cream that looks just as advertised. At 70 grams a serving, I was expecting a bit more resistance when scooping some into a bowl but it was reminiscent to scooping a slow churned flavor. Thankfully the texture matches up with the density confirming that this is a premium ice cream. As for taste, it’s not as potent as I was expecting. The base is more reminiscent of sugar cookies than cake but I’m not complaining. Birthday cake flavored bases can be overbearing and too sweet but I’m happy to report that Perry’s took a more restrained route. The excess sweetness for the most part comes from the perfectly colored blue frosting swirls. These swirls really bring that birthday cake quality to the flavor. Well my definition of birthday cake at least. When I was younger, I was the kid who would go for the piece of cake with the most frosting. I’d then attempt to remove as much of the cake as possible and enjoy my plate full of frosting. The frosting swirls are definitely sweet but they aren’t concentrated enough to put you in a sugar coma. 7 year old Nick might be disappointed by this but 21 year old Nick is grateful. 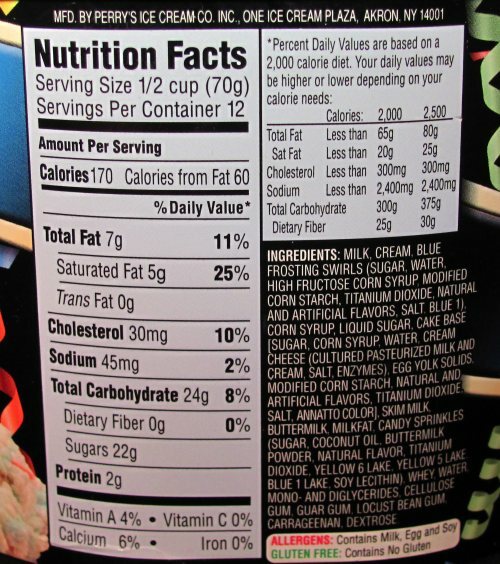 It lets you enjoy the flavor without feeling like you’ve reached your sugar quota for the day. Lastly, the sprinkles are just as you’d imagine them to be. They add a change in texture with a noticeable crunch but that’s about it. If I had to make a change to this flavor, I’d add some cake chunks. The sprinkles just don’t add enough of a textural component and I feel like the chewiness would work wonders here. As is, this is one of the better birthday cake options I’ve tried and I think Dubba would even approve of it. Verdict? A more adult take on a childhood favorite. Once again, I’d like to thank everyone for the support over the past 2 years. Here’s hoping for many more! Congrats on 2 years Nick! Like you, I also love it when the picture matches the ice cream, too. 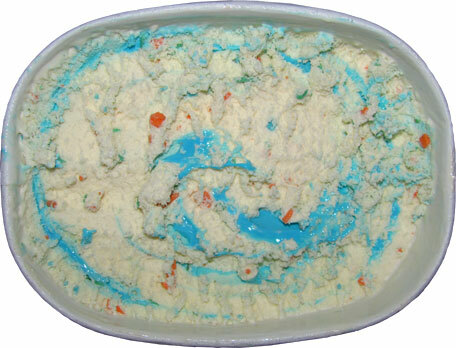 This is a pretty looking ice cream, and the blue frosting ribbons reminds me of Edy's Take the Cake ice cream, which I think was one of the first ever cake flavored ice cream. Those ribbons were the best part because they were sweet and gave the ice cream that cake feel we all love. I have never understood why companies use confetti sprinkles over cake pieces because they don't add any flavor, just a textural crunch. Perhaps it's a cost issue where the sprinkles are cheaper. Who knows? 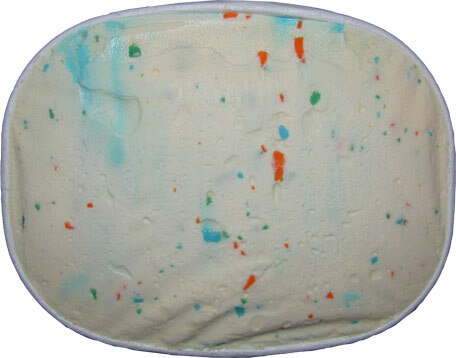 But since you liked this, maybe you will like the Wal-Mart Birthday Cake ice cream, which seems to have all of the same components as this one. Thanks for your wonderful 2 years of service dedicated to ice cream! Each time you sample and review, you do all of us a service by guiding our decisions.